Guest speaker: Paul Rogers - ex Captain and Business Development Manager of Brighton and Hove Albion Football Club. Inter-Park Trading Show - Prior to the meeting and at the same venue, there will be an Inter-park Trading Show from 4.30pm, where you will be able to see a range of unusual businesses based on Lancing Business Park. (LBP) We will also be displaying an Inter-Park Trading wall. Don't miss this opportunity to showcase your business to other members on LBP. There is a document for you to complete and customise with your logos etc and return asap. Please click here to download. In accordance with the B.I.D. best policy, applications are invited for any person wishing to stand for election as a member. 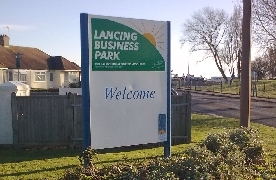 A notice signed by a member qualified to vote at the general meeting should be sent to Lancing Business Park Ltd. The notice must state their intention to propose their nomination for appointment and must be accompanied by a notice signed by the nominee of his/her willingness to be appointed. The closing date for receipt of nominations is Friday 14th February 2014.
of Brighton and Hove Albion Football Club. We are delighted that Paul has been able to accept our invitation to speak about the new training ground nearing completion at Mash Barn, Lancing and to answer a few questions on the Seagulls progress this season ! Please register your attendance and we look forward to meeting you on Thursday 20th February 2014.